It can be tough to find an honest vaporizer review. They’re often sponsored by big name manufacturers. And what you get is a bought opinion. These reviews almost always spotlight the famous vaporizers and marginalize lesser known vapes, keeping hidden gems out of the public eye. At Vaporizer Review, we like to give small businesses a platform, too. 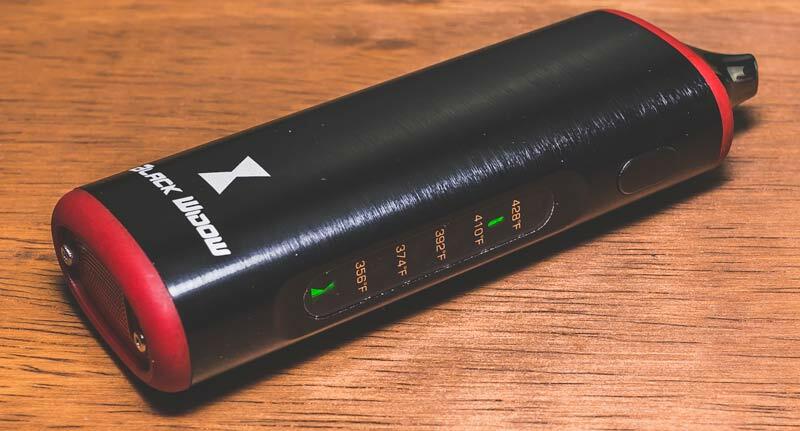 That’s why we were happy to oblige when the folks at thegrizz.ca asked us to review their relatively unknown portable vape for dry herb and wax, the Black Widow vaporizer. What we found was a formidable vaporizer that stands toe-to-toe with its biggest competitors, and places buyers in moral quandary of going with the big name or taking a chance on the little guy. The first thing I noticed about the Black Widow vaporizer is that it looks like a larger version of the Pulsar APX. The larger size can be a pro or con, depending on how you like to vape. While you lose the ability to conceal the vaporizer in your hand, you still enjoy pure and tasty vapor production and a solid yet lightweight feel. Temperature controls of the Black Widow vaporizer are preset, so you don’t get to choose with precision what temp you vape at. But the presets are geared toward the most popular dry herb strains and wax concentrates. 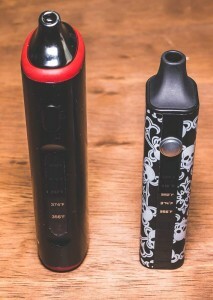 The Black Widow vape is sleekly designed, with a neat spider logo, a smooth exterior, and a very sturdy build quality. 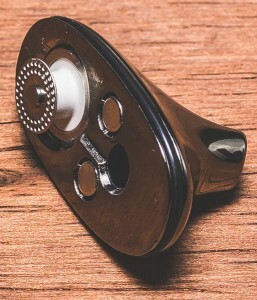 The stainless steel mouthpiece connects magnetically (rare for a portable vaporizer) making it easy to load the deep-dish ceramic heating chamber hidden beneath it. Lastly, I noticed the USB charger, which is very convenient for powering up the vaporizer on-the-go, is slightly skewed (though still usable) on the model I received. Cleaning brush – A black wire brush that fits well in the heating chamber. Features a braided metal handle that’s bendable but fairly easy to grip. Tweezers – Made of sturdy metal with ridged handles for extra grip. Comes with a curious heart-shaped muzzle to keep the tweezers closed when not in use. Packing tool – A metal pick with a scoop on one end and a piston-shaped packer on the other. Efficiently handles wax concentrates and packs down dry herb bowls. Not meant for scooping dry herb. Wax cup – A metal cup with an open-faced lid that screws off to reveal a screen onto which you load your waxy oils. This wax cup slips into the herb chamber. Insertion and removal is fairly easy. Also comes with a replacement screen. USB Cable – A standard black rubber cable with a little under 2 feet of reach. Very convenient for charging from anywhere with a USB or wall outlet. Wall Adapter – A black plastic box that enables USB charging from an AC electrical outlet. Mouthpiece Sleeve – A white plastic sleeve that slips over the nose of the mouthpiece to keep it germ-free when sharing. The Black Widow vaporizer has a decent feature set with a few remarkable nuances. I’m particularly impressed with the mouthpiece, which improves upon the Pulsar APX with a more durable steel construct, a smooth, sculpture-like design, great airflow, and a magnetic lock. Popping the mouthpiece off and on is seamless, and the piece feels wonderful to touch. 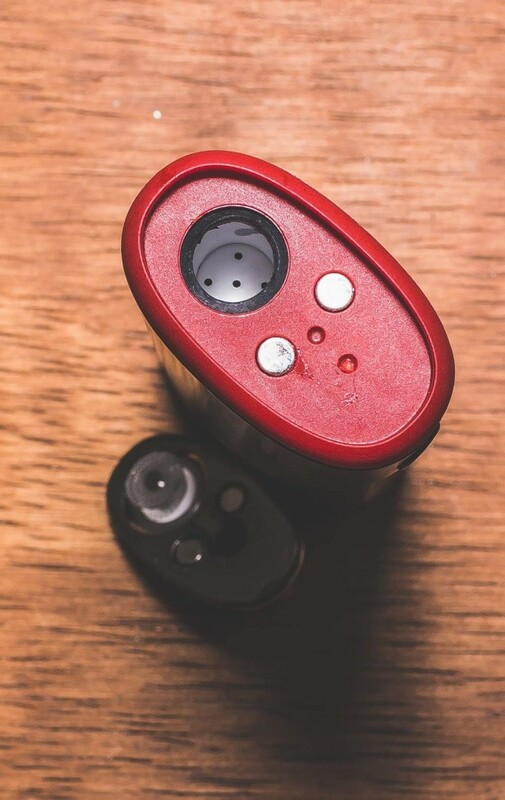 The single-button control of the Black Widow vape is a simple plastic button that’s slightly loose and makes a clicking noise when pressed. A display panel features the five preset temperatures (428F, 410F, 392F, 374F, 356F), and a red LED light shines above the temperature you’re on. When the Black Widow vaporizer is on, a backlit green hourglass symbol glows at the bottom of the display. Under the mouthpiece you’ve got a circular top screen that acts as the lid of the herb chamber. I wish this screen were replaceable, as it will likely build up resin and other grime over time. Hard, smooth, and lightweight, the Black Widow vaporizer features an anodized metal body that’s cool to the touch, and is easy to pop in and out of your pocket. The shape is ergonomic so the device won’t easily fall out of your hands while vaping on-the-fly, and the rounded top and bottom along with the curvature of the mouthpiece give the device an overall comfortable feel. 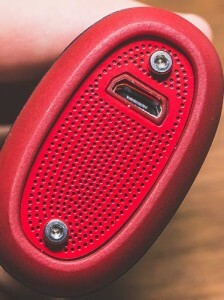 The bottom of the vaporizer has a perforated metal plate with protruding screws. I feel the design would be more aesthetic if the screws were flush with the plate. But it doesn’t in anyway affect the performance or usability of the Black Widow vaporizer. In fact, let’s talk about my experience vaping with the Black Widow. I thought it only fitting to vape a sweet and pungent nugget of Black Widow from a vaporizer of the same name. I filled the herb chamber, which is quite deep, with ground herb and a pinch of kief at the top. I stamped it down with the loading tool to keep the load dense. This method promotes thorough vaporization and larger clouds. 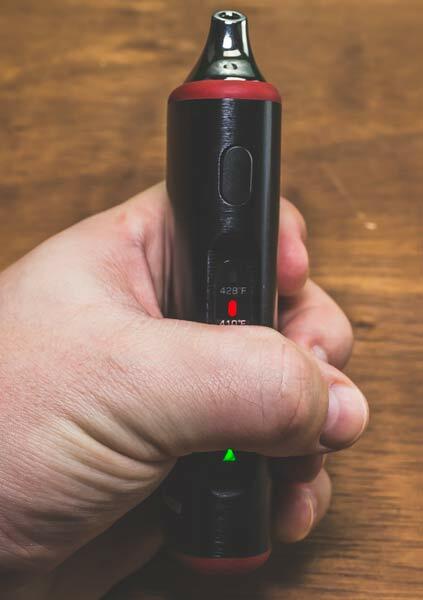 The Black Widow vaporizer is powered on and off using the usual five-click command, but toggling vape temp is a little different from other portable vaporizers. Instead of a click-based control, you choose temperatures by holding the button down and waiting for a red LED light to pass over the temperature you want. You then release the button to choose that temp. This approach is, in a way, easier than the usual three or five click controls. It makes less noise and it’s easier to operate. But it’s a little slower, and not ideal for a quick vape session. Luckily, the Black Widow vaporizer remembers and automatically reverts back to your last temperature, streamlining your temperature control. Heat up time is a rapid 20 seconds. I set my Black Widow herb to vaporize at 374F. The vapor delivered by the Black Widow vape was mild and flavor-rich. The ceramic herb chamber vaporizes dry herb slow and low for clean-tasting vapor. Now here’s the story on cleaning up the vaporizer after sessions. That top screen I mentioned previously is fixed in place (although it spins) and needs to be cleaned quite frequently. The wire brush is fairly effective in cleaning the screen, however, you might want to buy some alcohol wipes. Make sure to brush the herb chamber out after every few sessions. Not that the herb chamber gets dirty too easily. But it has a deep dish design, so if you let the resin build up for too long, it can be more difficult to clean out. The metal mouthpiece of the Black Widow vaporizer is very easy to clean. A wet paper towel will do. And if it’s messy with wax or resin, some alcohol isopropyl will break down the waxy oil. I base much of my confidence in the quality of a vaporizer on the unit’s warranty. And the Black Widow vaporizer has a solid 1 year guarantee. That said, keeping the unit clean will help you avoid having to go through the warranty claim process. And the Black Widow vaporizer is easy enough to clean and maintain. As I mentioned earlier, the closest competition to the Black Widow Vaporizer would have to be the Pulsar APX. While both vaporizers have very similar designs with anodized metal casings, and five preset temperatures, the Black Widow is larger with a more solid build, and has a metal mouthpiece with a magnetic connection. That said, it doesn’t come in various color options like the Pulsar APX, and the APX is cheaper at $59.99 while the Black Widow vaporizer is $139.99. Both vaporizers perform well, so it really comes down to three things: Your budget, whether size and color matter much to you, and whether you want to support a small entrepreneur with a dream or a larger company that’s already very established. The Black Widow vaporizer may be more expensive, and you’ll likely get a better deal from larger companies, but it comes with plenty of accessories. And I do find satisfaction in supporting a smaller, up-and-coming business. The overall look of the Black Widow vaporizer is sleek and minimalistic. And the spider logo is superhero-esque. I like being able to easily toggle through the most popular vaporization temperatures without waiting too long for the vaporizer to heat up. Lastly, I enjoy the metallic mouthpiece with a magnetic lock. It’s really easy to disconnect and reconnect. And the ergonomic shape and cool, smooth surface feels great. The Black Widow vaporizer is a solid unit. In terms of performance, usability, and design, there’s not much to fuss about. But there are a few things I hope they improve in the next iteration. For one thing, the USB port of the vaporizer I reviewed had a USB port that was not aligned with the USB-shaped hole in the bottom of the unit. Took some wiggling to get the USB to fit. Next the built-in screen beneath the mouthpiece, which sits on top of the herb chamber, is not ideal. It should be replaceable in case it gets damaged, and removeable to make it easier to clean. Lastly, the Black Widow vaporizer could be a little shorter in height. About an inch shorter and the vaporizer would be completely concealed in the average hand, making it more discreet. The Black Widow vaporizer offers excellent vapor production, a sleek and solid design, and fairly good ease-of-use. It’s not perfect, but it survived our review with only a few complaints. In the end, I think this vaporizer is meant for those who support the little guy, who would rather shop at a Mom-and-Pop grocery store than Walmart. You will appreciate the excellent customer support that a smaller business has to offer. You will relish in the uniqueness of the vaporizer in your hand. And I personally think the Black Widow vaporizer has a sturdier build quality than the Pulsar APX, which helps justify its higher price. On the other hand, those who value affordability and compactness, and feel more comfortable taking the oft-trodden path, should flirt with the likes of the Pulsar APX instead. If this sounds like the portable vaporizer of your dreams, or you are looking to throw some support to the “little guy” then you can find the Black Widow right here. I do get compensated if you purchase through my link, but I never let that affect my choices and I truly believe this is a solid vape. I bought my Black Widow about a week ago. I had just gotten my medical card and wanted to try vaping as a healthier alternative to smoking, so I walked into my neighborhood vape shop and chose this unit as a blind buy. I have used my friends’ vaporizers before, but I had never bought one and was used to smoking my herb in a pipe. That said, I haven’t had any problems with the Black Widow. It’s easy to use, discreet enough (it looks like a portable charger to me), and the white mouthpiece keeps the metal top from touching your lips (the metal can get pretty hot at the highest temp settings). I like that it’s pretty rare, too. When I pull it out in groups, I get a lot of interest and questions. I have only used it for dry herb, so I don’t know how well it performs with wax.